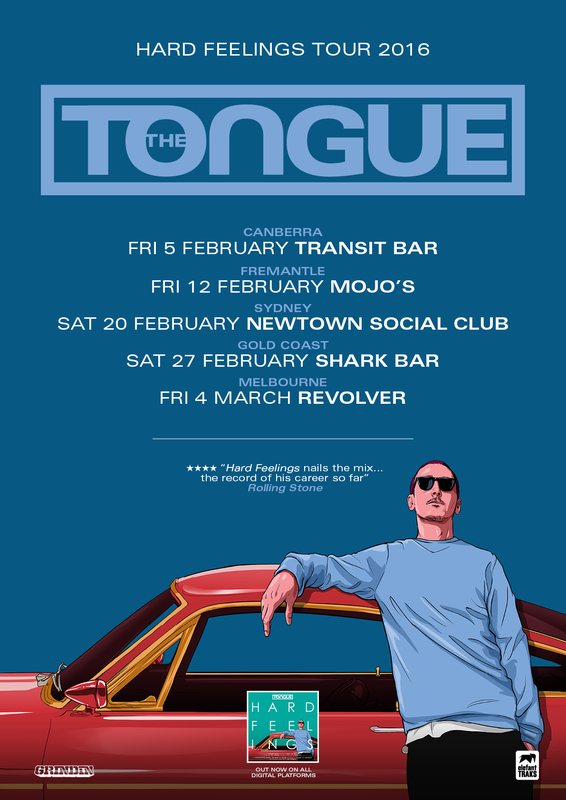 The Tongue launches his new album “Hard Feelings” across Australia in February and March. The Tongue is a man on a mission; to create a classic hip hop album. In 2015 the people will decide if that moment has arrived as he delivers his most undeniable record thus far. Hard Feelings is the combined effort of both The Tongue and rising Sydney producer Papertoy. Together they’ve crafted an album that touches on the joys and frustrations of modern life; from the pulsating club-banger “You Got Me” through to soulful jams such as “Proud” and “Setting Sun” and political anthems like “The Knock”. Tongue proves himself to be in his prime as both a lyricist and performer as he deconstructs life’s complexities with wit, style and a pinch of humour. The Tongue has enjoyed a trail-blazing career which has included highlights such as being longlisted for the Australian Music Prize (for his album Surrender To Victory), performing at the Sydney Opera House, and opening for some of hip hop greatest acts, including Ghostface Killah, Public Enemy, Dizzie Rascal, Pharoahe Monch and more. Released nationally November 20, Hard Feelings will be the final statement of the year from iconic Sydney label Elefant Traks. Guests on the album include: Ngaiire, Jeswon (Thundamentals), Ev Jones (Jones Jnr), Thom Crawford and Mataya (who is still flying high from featuring on Hermitude’s platinum single ‘The Buzz’). As you push play, be prepared to enter The Tongue’s cartoonish world, you’ll hear pain, triumph, ecstasy and pride. Just a couple of Hard Feelings.